Free Shipping Included! Satya Jewelry Citrine Gold Plate Om Triple Chain Necklace, 20'' by Satya Jewelry at Femi Store. MPN: NG13-OM-L20. Hurry! Limited time offer. Offer valid only while supplies last. 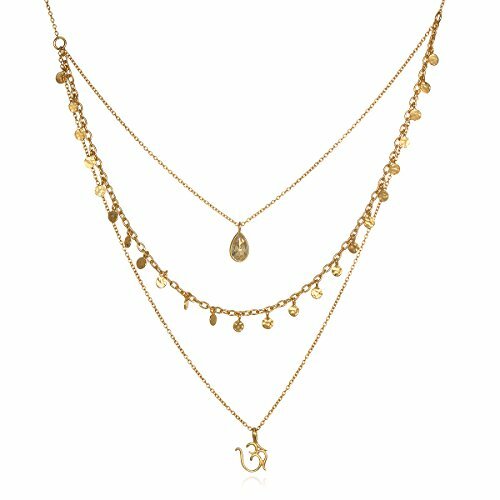 This 3-in-1 necklace invites you to trust the voice within; Om charm and Citrine stone are joined by a fluttering chain so you have the layered look effortlessly. Pear shaped 6x8mm Citrine stone is joined by a fluterring chain and Om charm. 18kt gold plate over brass, 20-inch long.